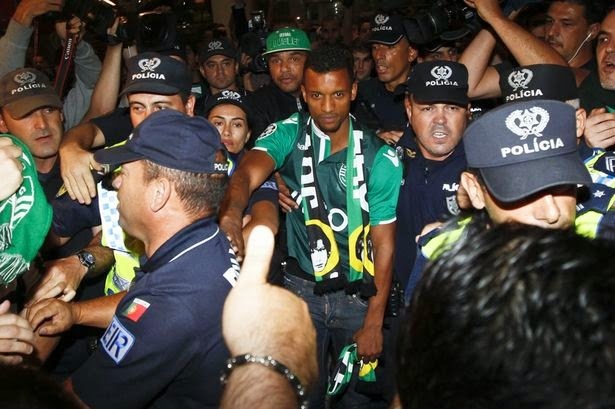 The return of Nani to Sporting CP has been received by fans as the new coming of Christ, and while I understand the happiness and enthusiasm of the fans, I don’t believe this is a good move for Nani. Taking myself out of the context of the club and fans and looking at this move from a purely player perspective, I don’t believe the player has made the correct choice in order to further his career, and I offer you 10 reasons why his return to Sporting CP was a bad choice for Nani. He is without a doubt the most talented player on the team, and also the one that holds the highest profile on the team. Fans will look at him as the one who will take them to the promise land, and this could bring additional pressure for the player to perform, which is not always conducive to good results. He will at a certain point feel like he is carrying the team on his shoulders, and that pressure combined with perhaps one or two bad performances can turn things around and create a very hostile environment for him. Players from opposing teams will look at him as a target. A player trying to make a name for himself will look at Nani as someone that could help them achieve that and therefore he is more vulnerable to a harsher tackle than others on the team. He is a star, and opponents will treat him differently for it, he will have a huge bull’s eye on his back. Say what you will, but for Nani to return to Sporting CP at this stage it is nothing less than a step back in his career. He would had been better off moving to a mid-table Premier League team or even moving to another league like Serie A or Bundesliga. I don’t mean this as a knock on Sporting CP, but the fact of the matter is that the Portuguese League doesn’t have the same exposure as other leagues and Sporting CP while a big club in Portugal does not offer the same visibility as a Roma, Tottenham, Napoli or Bayer Leverkusen. He can’t afford to have a bad season with Sporting CP. Everyone is looking at this move as a chance for him to re-launch his career, since his numbers at Manchester United for the last two seasons had been horrible. If he comes in and fails at all levels, more will start to look at him as a flop. He would be looked at as someone who hasn’t been able to play for a club of the size of United and someone who couldn’t even be productive in the Portuguese League anymore. This is the biggest risk he is taking with this move. The return home could also end up making him feel too comfortable. That comfort could eventually turn into laziness. It is easy to kickback at take it slow when you are at home and that could lead him into a situation where he is not pushed to elevate his game. This is very important for him, so he can place his career back on track. I am not sure how motivated he is when he knows that his stay is only for one year. He knows his future won’t be in Lisbon long term, so staying motivated when you are playing teams like P.Ferreira instead of Arsenal or Liverpool will be a dangerous proposition for a player like him. I am not sure his motivation week in and week out will be there. His stay in Portugal will mean incredible media coverage of anything he does. All of his actions on and off the field will be scrutinized by the media to the infinite detail. This is not good for anyone and more so for a player that has such a high profile already in the country. This could also act as a negative on the rest of the team, but I believe will ultimately impact his play on the field. He is a very talented player, but he is not a leader. He is someone who can fit into a team that has an identity and structure and be a contributing factor on a team like that. This won’t be the case in Lisbon. Sporting CP is a fairly young and inexperienced team, and he will be looked at as a veteran and a leader, something I don’t believe he will be able to be and may hurt his performance on the field. Sporting CP has a new coach this season in Marco Silva, perhaps not the perfect coach to help Nani put his career back on track. Nani could use the guidance and leadership of a more veteran coach. Nobody is denying Marco Silva’s talent but he is very green and in terms of someone who could act as a father figure for Nani. He is not that person and that is what he needed. I believe he will struggle to adapt to a club where the internal demands will be far lower than what he has been used to, but the overall external expectations will be higher. His mind will have to be in the now and not on what will happen next season and where he will be playing. Internally, everyone is happy to have a player of his caliber on the team, so he will be allowed things that many aren’t, but the overall external expectations will be a huge contrast to what he sees on the inside of the team’s structure. This can hurt him as a player and for someone who needs to rebuild his name and game is not the best of situations.